LOCATION : Spa Pool, Hammersley Gorge, Karijini National Park, Western Australia. 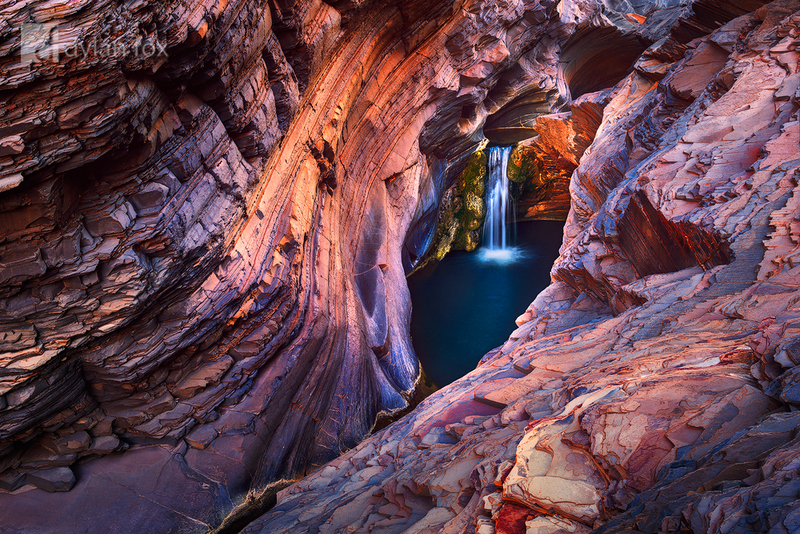 Hammersley Gorge is part of Karijini National Park in Western Australia's Pilbara region. This particular gorge is home to some of the most unbelievable rock formations. Where the gorge has cut through the earth the layers revealed are incredible warped. The pressures they have been under must be incredible. This photograph is of Spa Pool. A smooth and very deep natural pool carved over millions of years into the sharp jagged land. I love its contrast against the rough textures that it has eroded away. Karijini is spectacular and a place I will return to many more times in the coming years. It is a real demonstration of mother natures power and sheer beauty. Secure your limited edition, Spa Pool print, 'Treasure', by selecting your desired print size in the menu to the right.